Last 12th October, I came from Amsterdam to Madrid by plane. That day there was an air controllers strike in France. While flying, the pilot commented that the company had tried to re-route the flight in order not to lose the slot it had, this proved almost impossible so what they did was to fly at a lower level. The pilot explained that this was very “costly as the engines consume much more” at that lower level. How much more? How costly was this measure? I wanted to check it out, and some weeks later I have made the numbers that I show here. We flew in an Airbus A321. Since it was the early flight in the morning I assume it carried maximum fuel and the weight was limited by Maximum Landing Weight (75.5 tonnes, MLW), so the takeoff weight would be the MLW plus the fuel weight we would consume in the flight, in the order of 5,500 kg (an average of 2,400 kg/hour according to some operators). Thus I used a takeoff weight of ~81,000 kg. 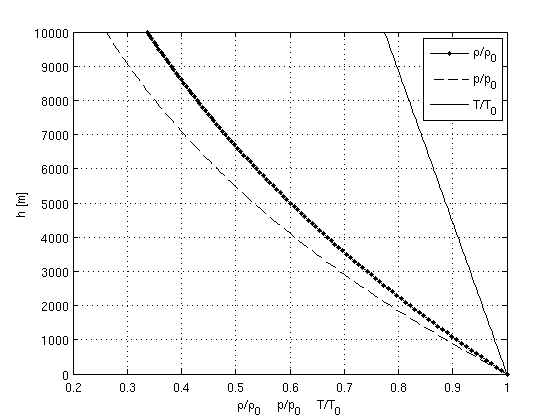 When flying at a lower level, the air density is higher and this increases drag. Normally, planes in this route fly at ~ 33,000 ft or ~ 10,000 m. What flight level did we use? This I don’t know, so I took the worst situation: say we flew at FL210, or 21,000 ft (~ 6,400 m). We can find at the chart the Standard Atmosphere and see the difference in density at both altitudes (~ 0.53ρ0 compared to ~ 0.33ρ0). 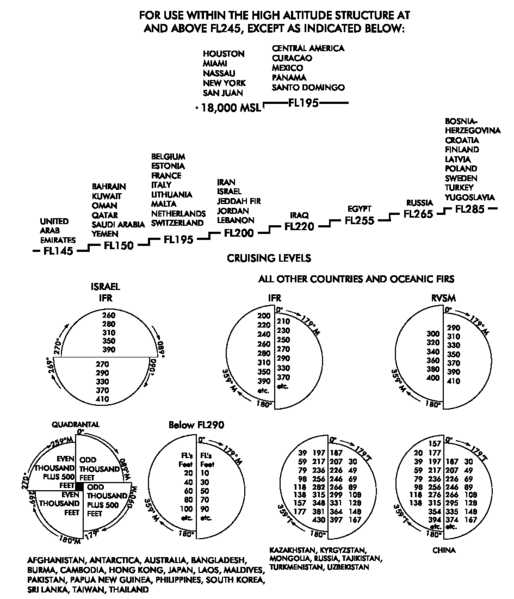 Flight levels, image from Wikipedia. Standard Atmosphere, image from Wikipedia. Using the Breguet range equation, all other things being equal (same distance, same aircraft, same weight at the departure…), we can relate the weights and densities of the initial flight plan the company had and the one used after trying to re-route. The result I got is that by flying at FL210 instead of FL330 the aircraft would have consumed over 1,400 kg of fuel more, a whole 26% more. I checked the prices for fuel at IATA (International Air Transport Association) and at the moment is 746$/mt. The 1,400 kg of extra fuel would cost about 1,050$ (~ 760€), or about 4.2€ more per passenger (assuming we were around 180 passengers). If you are picking pictures from Wikipedia, you could provide a link to the Commons page and the name of the author. Wikipedia is made of people, like Soylent Green. I must be missing something in the “picture”. Who is Soylent Green? Is the author of the picture I used? I didn’t find his name… or some term for advanced users? It’s a joke, a pun. To explain it, I would have to give a way the ending of the film. Sorry I didn’t see your answer until now. Can you explain “re-route the flight” sounds like you were flying really low over France ?? Or is it an alternative non-commercial flight path over the sea ? Can you assume an aircraft leaves first thing in the morning with a full tank ? Maybe countries with less tax on fuel, subsidies, or that are fuel vendors on that days route ? Since they were on strike, I understand they tried to go as much as possible out of French air space, but since everyone must have been doing the same that day due to the strike, most flight levels might have been already full. That is why they opted for flying within allowable air space but lower (could have been down to FL210) despite the increase in cost. Whether aircraft depart full of fuel or not depends on many factors: the distance they’re going to travel, the expected weight on arrival, and as you said the cost of fuel. The A321 can carry 24.000 litres of fuel, or ~17 tonnes (metric), and that flight normally would consume ~5.5 tonnes, thus they could chose whether to load up to 17 tonnes in Amsterdam or less and then refuel in Madrid. For the calculation I just *assumed* the plane was full to see the most conservative case, i.e., the heavier the airplane the higher the impact of higher fuel consumption due to the lower flight level and thus the extra 1,400kg of fuel is the maximum the company might have suffered that day.